To a medium sized bowl, add quinoa. Cover with water and soak for a few minutes. Then stir with a whisk until the quinoa turns the water cloudy (the film from the grain is being rinsed away). Strain quinoa in a fine mesh sieve. When ready to cook, add quinoa to a saucepan with 1 cup water (2:1 ratio). Bring to a boil, then reduce heat to a gentle simmer. Cover and simmer for about 15 minutes, or until the grains split. To the previously-used skillet, crack an egg gently, making sure not to break the yolk. Sprinkle it lightly with salt and pepper. Cook on medium-low heat for about 1-2 minutes, or until bottom sets. Flip and cook the other side. Remove from heat when egg is set. The yolk should still be runny! 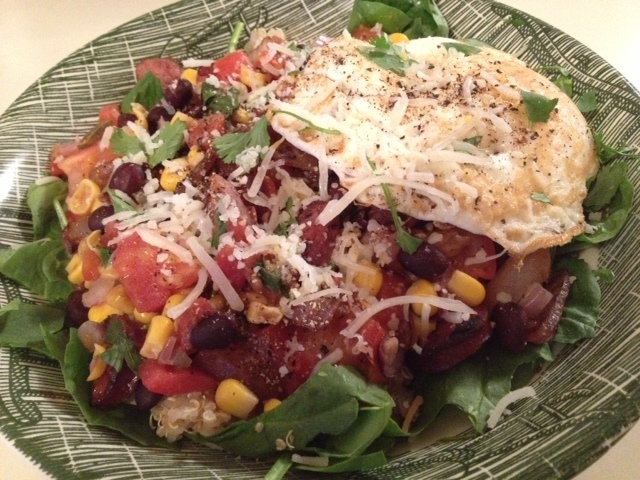 Layer spinach, 1/4 cup quinoa, 1/2 cup corn and bean salsa, and fried egg in a shallow bowl. Sprinkle with additional pepper, cilantro, and shredded cheese. Serve with salsa and sour cream if desired!